Whether I am working with a massage client, showing someone stretches as a personal trainer or working with a client as a wellness coach, there is one thing I’ve learned to do when explaining new behaviors: I have my clients try the new behavior/stretch/exercise in front of me. This allows me to see if they understood my instructions and can accomplish the new task without too much difficulty. It also gives my clients a “body memory” or an experience with the new activity that goes beyond simply watching someone else do it. By experiencing a new behavior in the best possible form or manner, my clients then have a better sense of how it feels to do something correctly. If I can’t demonstrate of watch my client try a new behavior, for example, when I am wellness coaching (which is usually done via telephone), I have my clients repeat back to me what they think the new goal or behavior would be. For example, if I want someone to breath deeply, I can have them try it and then listen to see if they are breathing with too much or too little effort. That all said, it’s time to experiment with you and your taste buds. If your experience with eating vegetables brings these memories to mind, do you have any desire to eat vegetables? Likely not. This is one problem with being told by media and the government agencies (and me!) to eat more vegetables. Some people do eat fresh veggies and delight in salads with arugula and jicama, or nosh on fresh steamed broccoli with gomashio (ground up sesame seeds with a touch of salt. It adds a nutty favor to any dish.) I was lucky enough to meet health food friends in college and shop at one of the first Whole Foods in the Midwest in the 1990’s. But many of my clients and those in the suburbs or with little access to the variety of foods available in big cities, still think of veggies as the canned, frozen green plants best smothered in cheese or dressing. Change is tough, I know. And habits are hard to break. It’s so easy to stop by Micky D’s or Wendy’s or BK. Prepackaged baby carrots and iceberg lettuce salads are easy to prepare. If you don’t know how to prepare vegetables so that they taste good, it may be slightly risky to break out of the mold and try a new dish. But it’s well worth it! If you read my blog, you know I am a big fan of the veggie steamer. Steaming broccoli, cauliflower, carrots, zucchini and even spinach makes for a truly amazing burst of sweet veggie flavor. For people accustomed to eating foods with corn syrup or sugar fresh veggies may seem too bland still. For those folks I recommend you try adding a touch of olive oil, ground up sesame seeds (gomashio) or even a tiny sliver of butter to steamed veggies to ease into eating more veggies. Butter is not great for you considering it’s high saturated fat content. But in moderation, it’s better to eat a plate of steamed veggies with a sliver of butter than eat no veggies at all! Try something for me, then let us know how it goes via the comments section. 2. Cook both the canned/frozen and the fresh veggies in separate pans. 3. Try a blind folded taste test with just yourself or with your family as well. 4. Taste each version of the vegetable. What do you notice? Which version do you like better? 5. If you have not had steamed veggies before, did you think they tasted better than the canned or frozen variety? Does this taste test give you hope for being able to eat veggies more often? If so, then you are ready to move on to…brussal sprouts! For a Nutritional Analysis of different versions of green beans click here. 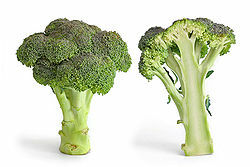 For a Nutritional analysis of broccoli click here. Includes a fairly healthy recipe for broccoli soup! Creative ideas on how to feed your kids more fruit and vegetables click here. Note: I, Sue Shekut, am strongly affiliated with broccoli and fresh veggies. I admit it, I eat steamed broccoli about 3-4 time s a week. Sometimes more!